John Williams was born in 1744 in Orange County, New York, according to his pension application. He enlisted in the service in the summer of 1777-1778 and served two months as a private in Captain John Minthorn’s Company, Colonel John Hathorn’s New York Regiment. The following year, he served six weeks. In 1779 or 1780, he served three tours of four or six weeks each as a private under Captain Peter Petoloff in the New York Troops and guarded the frontiers against the Indians. John Williams served at Minisink, New York on the Delaware River under Captain Petoloff, and friend of General George Washington, Colonel John Minthorn, commanding officer at the disastrous Battle of Minisink. On July 20, 1779, at Minisink Ford, British ally, Mohawk Joseph Brant, raided homes and burned much of the hamlet and on July 22 in a battle killed forty four of the Orange County Militia. The survivors were so fearful since that massacre that no one returned to the battle scene until forty years later and found the remains of the fallen militia who were then given a proper burial and a monument erected in their honor. Before the close of the war, John Williams served at least six or seven other tours on the North River. A few years after the war, John moved from Orange County, New York to the Susquehanna River near Wilkes-Barre, Pennsylvania. John Williams was listed as living near Goshen on the 1775 Assessment Roll of Orange County, New York. The 1800 Pennsylvania Census listed John as living in Franklin Township in Luzerne County. In 1817, John moved to Sunbury Township in Delaware County, Ohio to live with his daughter, Sarah Williams Patrick. He was listed on the 1820 Delaware County Census as living in Sunbury Township. Possibly, his wife, Sarah Brown, had died but is not buried with him in Sunbury Memorial Park and may have been buried in Pennsylvania. John is listed on the List of Male Inhabitants over 21 in Delaware County in 1835. According to Revolutionary War Records, National and Local from Original Manuscripts by Anna Smith Pabst, John filed his pension application in Delaware County, Ohio and when approved received an annual allowance of forty dollars when he was placed on the pension roll on March 22, 1833 with his pension allowance beginning on March 4, 1831. He was 90 years old. John was the brother of Anson Williams who founded Williamsville in Orange Township, Delaware County, Ohio. Recently, a historical marker was placed in Kingwood Cemetery on Route 23 commemorating Anson and his now non existent town of Williamsville. Anson and family are buried in the Williamsville Cemetery, all that’s left of Williamsville. 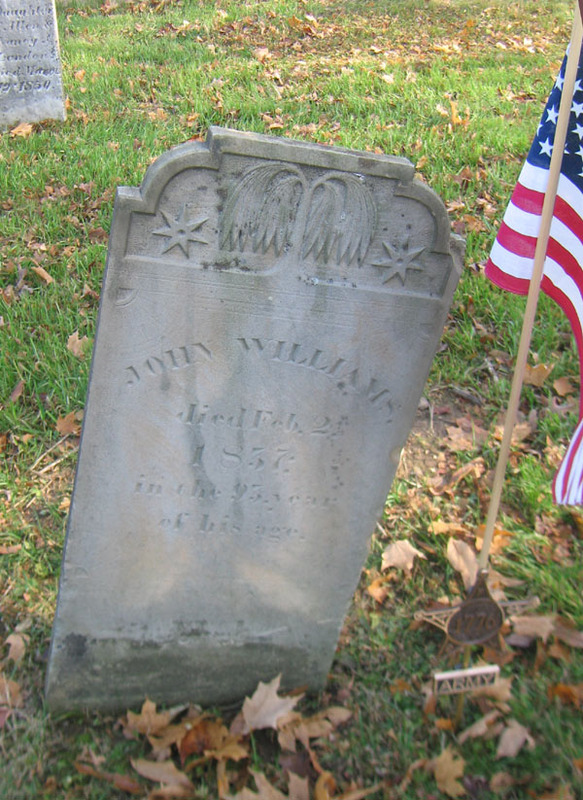 John Williams died February 2, 1837 at the age of ninety three and is buried beside his daughter, Sarah Williams Patrick, in Sunbury Memorial Park in Sunbury, Delaware County, Ohio. 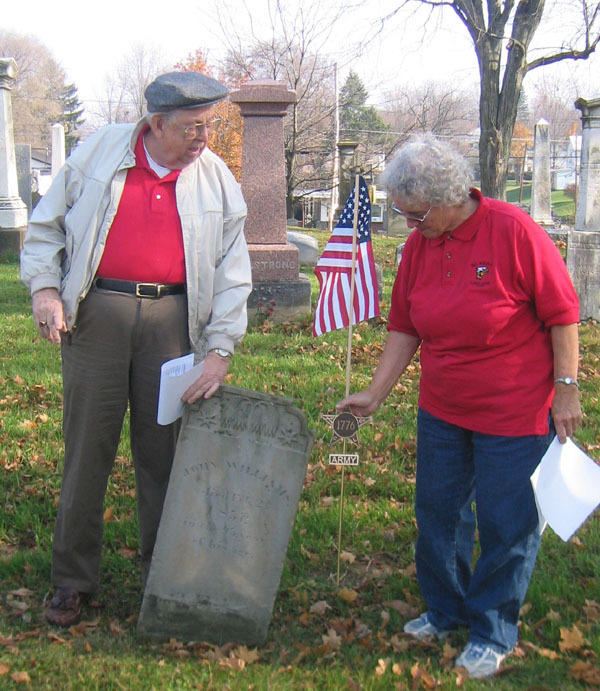 Neil Perfect and Suzanne Allen, descendants of John Williams, who served in the Revolutionary War placed a Revolutionary War marker at his grave in the old part of the Sunbury Cemetery for Veterans' Day, 2006. John Williams was the father of Sarah Williams Patrick, wife of Sunbury pioneer, Norman Patrick. Their daughter, Huldah, married Middleton Perfect, the early Perfect historian. Middleton’s son, Leroy Perfect, a Civil War veteran, was Suzanne's great-grandfather. Leroy’s son, Clyde Perfect, was the father of my mother, Maxine Perfect Link. All are buried in Sunbury Memorial Park.